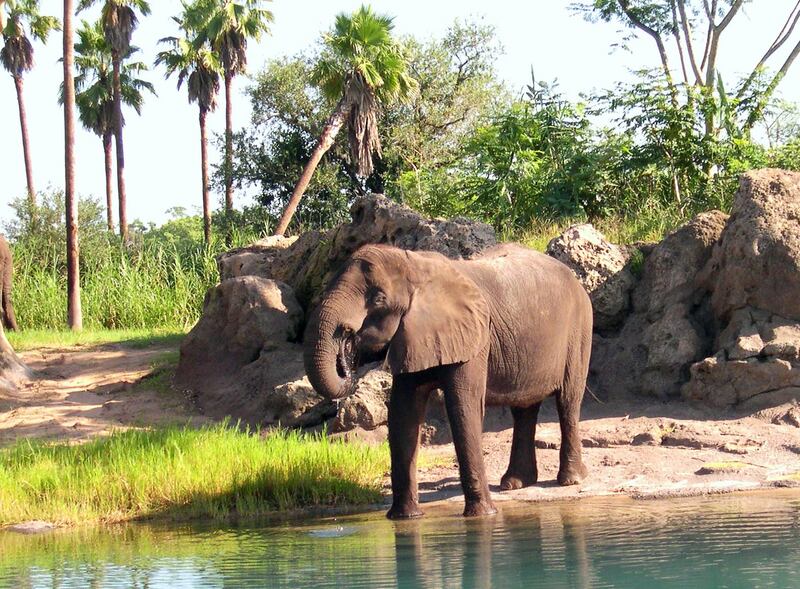 I photographed this elephant at Disney’s Animal Kingdom, August 2003. The oft-quoted words above were purportedly from a letter written by Chief Seattle to President Franklin Pierce. At least one historian has researched and dismissed the authenticity of this claim, and his arguments against its supposed provenance are rather convincing. However, the quote lives on because the beauty of the words have the ring of truth to many of us. Animals are not only an adornment to our world; they are essential for its survival. With photo and video technology, we have a front-row seat for viewing the diversity of the animal kingdom. The stunning variety of their appearance, behaviors and habits are a never-ending source of fascination for those of us who enjoy watching creatures who share this planet with us. Just as the fictional wizard Merlin taught the young Arthur about life by turning him into various animals, so we too have much to learn from the beasts. I’m thankful I’ve been able to watch all sorts of animals wherever I’ve lived and traveled, and while films will never replace the thrill of seeing them face to face, I’m grateful for digital glimpses of the inhabitants of regions all over the world. Cheers for the marvelous photography and painstaking research of humans who dedicate their lives to learning more about our animal friends. A link to the video below was sent to me by one of the readers in this online community. When I watched it, I thought of the quote above, because I did feel less lonely in spirit as I watched the movements and expressions of the video’s stars. Many of them are not the first animals we think of when we talk about the delights of “critters,” but this clip captures the amazingly wide array of life on earth by focusing in closely on just a few examples, and each is beautiful in its unique way. Today, I hope this video will spark fond memories of animals you’ve seen or loved, and gratitude for their presence with us here on earth, sharing and dispelling the loneliness of existence. Yes! And Job 39 – I especially love verse 18. Yes, I feel the same! Thanks for sharing with us. Sheila, it made me happy too. I felt almost as I did the day Pasha died. In the final hours of his life, I was lying beside him on the floor, my face close to his and looking into his eyes, and I was crying and crying. But as he looked back at me, calm and seemingly patient with my grief, it sounds crazy but for just a couple of minutes I was flooded with joy at how wonderful it was to have him in our lives and to have been able to love him all those years. It was almost a feeling of euphoria. Pure joy, apart from the sadness. I’m sure there’s some psychological or biological explanation for it, but it was one of the most unusual experiences of my life; great joy in the midst of almost unbearable sorrow. I felt something of that same kind of joy as I heard the beautiful music and watched the beautiful creatures. Life is a great mystery, one we are privileged to share. Thanks for being part of our world! Hee-hee! I think a fly would have RUINED that wonderful video. Maybe not, but I do place them (along with cockroaches) on the list of animals under the heading “Really? This is a joke, right?“. Hey, maybe they’re just there for contrast, or to provide food for some of the more appealing creatures. I really enjoyed the moment in the video where the two small monkeys reach out their hands to each other, so caring and tender. For me personally, that moment strengthens my commitment to be a vegetarian. Not that anyone here eats them, but as the video quietly shows, I believe all animals have a soul. I think they feel comfort, sadness, happiness and pain as we do. Coming home to a family pet can wash away a stressful day just by being accepting of your touch. As you know, looking into your dogs eyes and stroking an ear can heal your heart like no man made medicine could ever hope to do. Yes, I loved that scene of the monkeys too. I’ve heard no end of debates about animals having a soul vs. a spirit, or spirit vs. a soul, or all sorts of semantic discussions that basically leave me more confused than I was before. I do know that people are definitely distinct from the animals (and what makes us distinct is encapsulated in the librarian’s word humanities which delineates those things that belong specifically to humans – art, literature, theology etc.). But this in no way lessens their importance or grants us liberty to treat them any way we choose. I am not a vegetarian, though I eat meat or poultry or seafood relatively rarely. For me, it was the classic book Diet for a Small Planet, which I read in my youth, that first started me thinking that perhaps meat was not the healthy, essential component of a balanced diet that schools still taught us it was. Well said Mr Beston. Yes, I think luckily more people than not, acknowledge their mystical concept and that makes me happy. I just rescued two lady bugs off the garage floor and set them in my hanging planter. They most likely wondered in when the door was open. I was saying to one of them, “you’re lucky I stopped to sweep before driving in, I might not have know you were here.” Then I thought, “I bet the neighbour thinks me mad”…LOL. I never WORRY about it though. Others can see me any way that makes them happy, I do these things to take care of my own heart. My husband might even scoff but he’d wait for me to do my thing because he understands my love for all living things. When I hear of deliberate cruelty, I want to scream. The punishments are too lenient. It speak volumes of the mentality of these monsters and their lack of conscience is detrimental to society as a whole. In my estimation, someone who would do harm to a defenceless animal can not be trusted and would never be part of my life. I like that, “Happy Hens”. I only buy Free Range as well. I don’t mind spending more to ensure their lives are healthy and happy. We have also a farmer market near our home on Saturdays during the summer, there’s all kinds of fresh eggs and farm grown produce to pick from. In the winter months they move into our city hall. It’s nice to support the families committed to their lifestyles and organic farming too.